Whole wheat crackers are a wonderful teatime accompaniment. 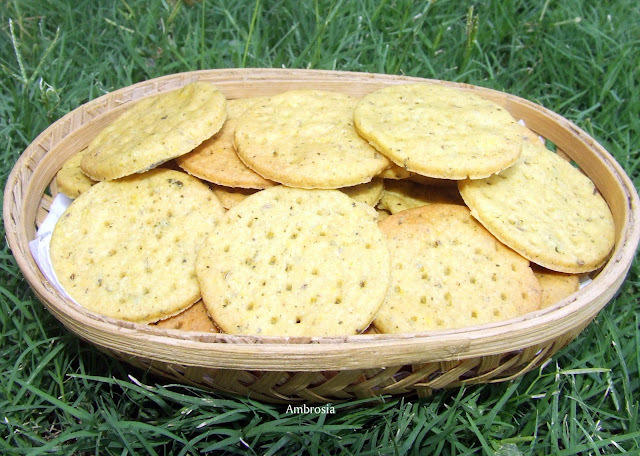 The crackers remind me of the goodies made at home by my grandmother and mother during Holi. The sweet and savoury snacks would be made in bulk. And the stock would last for days after Holi. We would eat to our heart’s content, take them in our lunch box and stuff in our pockets when we went out to play. I made the crackers using my family recipe but baked them instead of frying. My kids loved them with cheese spread, ketchup and also with mango pickle. 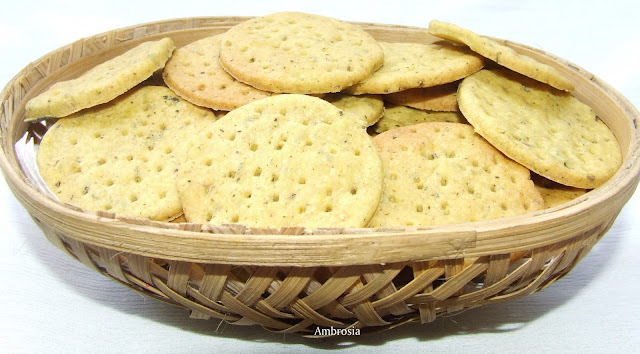 Crackers contain ajwain and turmeric. Ajwain is an appetizer. It is carminative, digestive, expectorant, laxative, diuretic, antihelmenthic and an aphrodisiac. Ajwain is a tonic for the stomach and is good for all the stomach related disorders. It gives relief in stomach ache caused due to flatulence, indigestion or infection in the intestines. Sieve whole wheat flour with salt, baking powder and turmeric powder. 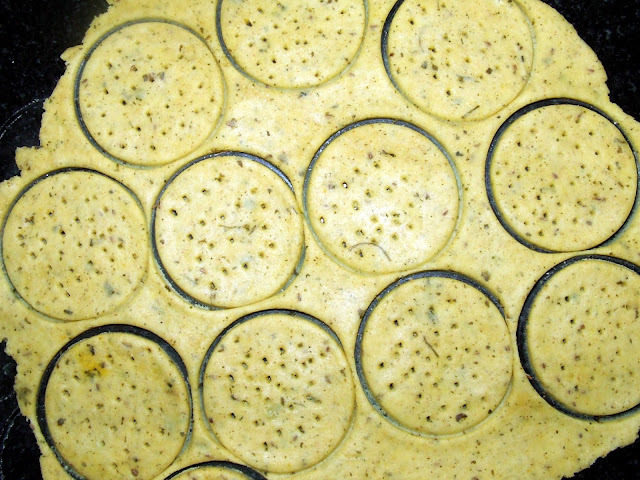 Add carom seeds and dried fenugreek powder. Add oil and yogurt and mix well with hands. Add water and knead soft dough. Cover the dough and let it rest for at least half and hour. Roll out a thin chapatti of uniform thickness. Cut out crackers using a cookie cutter. Bake in a pre-heated oven at 190 degrees C for 18 to 20 minutes or till the sides start browning.